The weekend of the 16th and 17th of June 2018 saw three significant events in my life. Saturday 16th June 2018 was my stag do; seven of us visited the Adnams Brewery in Southwold and enjoyed incredible food and hospitality afterwards at the home of my former trumpet teacher. The following day, after tidying up (and notably without a hangover between us), the final few of us went for a post-lunch pint of Adnams at the Sorrel Horse (near Barham in Suffolk) to celebrate my 30th birthday and to debrief after an excellent stag do. It was there in the pub’s garden, while basking in the glorious June sunshine, that I received an email from the Orchestra of the Age of Enlightenment inviting me to play principal trumpet with them on a tour of the Far East. I read the email with great excitement and checked my calendar. The dates (spanning five weeks) fitted perfectly in my diary without a single clash. Those weeks even coincided with the two weeks when my fiancée (or by then, wife) would be on a family holiday in the USA. I telephoned them back immediately to accept the invitation. It had been a remarkable weekend: stag do, 30th birthday and this incredible tour invitation. I read and re-read the email with awe, processing the remarkable list of countries that we would be visiting: Brunei, Thailand, Laos, Cambodia, The Philippines, Malaysia and Vietnam. I couldn’t have imagined a more life-enriching opportunity. I was absolutely delighted and honoured to have been invited and it certainly quashed any disconcerting feelings I had about becoming a tricenarian. I was definitely going to experience a lot more of Asia than I had in the uneventful hour that I had previously spent (technically) in Asia - inside Changi Airport on my way to Australia in September 2012. 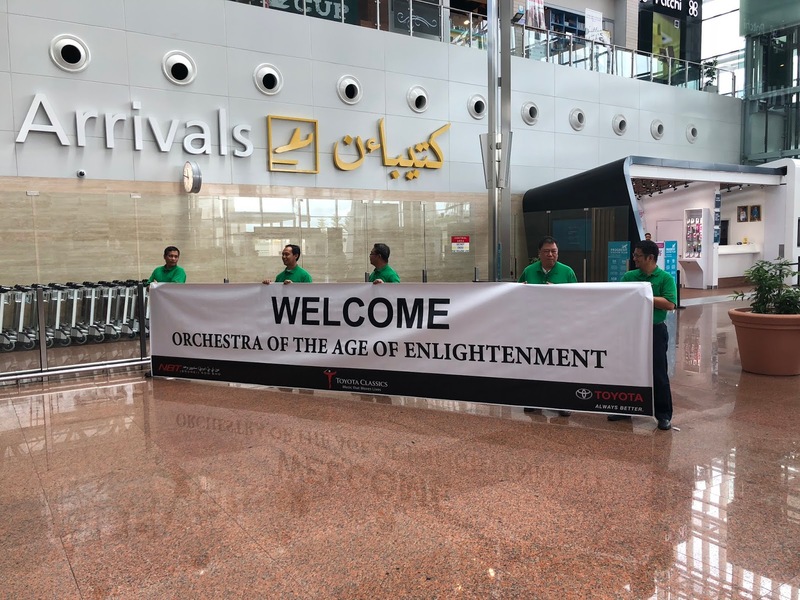 I was looking forward to experiencing the different cultures and cuisines of all these places, and I was happy to be invited to play with the Orchestra of the Age of Enlightenment again. The next few months were busy with organising travel plans, visa applications, passport submissions, instrument valuations, worldwide instrument insurance, worldwide travel insurance, vaccinations and so on. Rehearsals began on Monday 15th of October 2018 and a few days later, exactly four months after I had received the invitation, our group (of about 40 people) boarded an Airbus A380 at London Heathrow Airport for the Singapore Air flight SQ317 to Singapore Changi Airport. Around 16 hours later we connected onto a 2-hour flight (SQ182) to Bandar Seri Begawan - the capital of Brunei on the island of Borneo. The Orchestra of the Age of Enlightenment was selected for this, the 29th Toyota Classics tour. Toyota Classics has taken many world-renowned orchestras to Asia and has put on over two hundred concerts since 1990 - the proceeds of their concerts are donated to local charities. The 2019 tour, comprising seven countries in Southeast Asia, would result in seven memorable performances and additional, far-reaching educational projects for Toyota’s ‘Start Your Impossible’ scheme.